Years ago, my friend Cameron Mortenson introduced me to Fly Fishing. 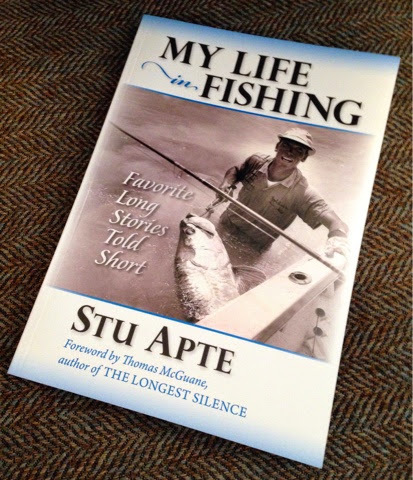 After practice casting a "noodly" old fiberglass fly rod on the lawn, I decided to look for a book for information on this intriguing new sport. I purchased the L.L. Bean Fly Fishing handbook written by Dave Whitlock, and read it several times, incorporating the tips and advice that Whitlock shared as I learned how to fly fish. I still have that book in my library, and look through it on occasion, since the advice is timeless. As well as being an accomplished writer, Dave Whitlock is an outstanding artist. 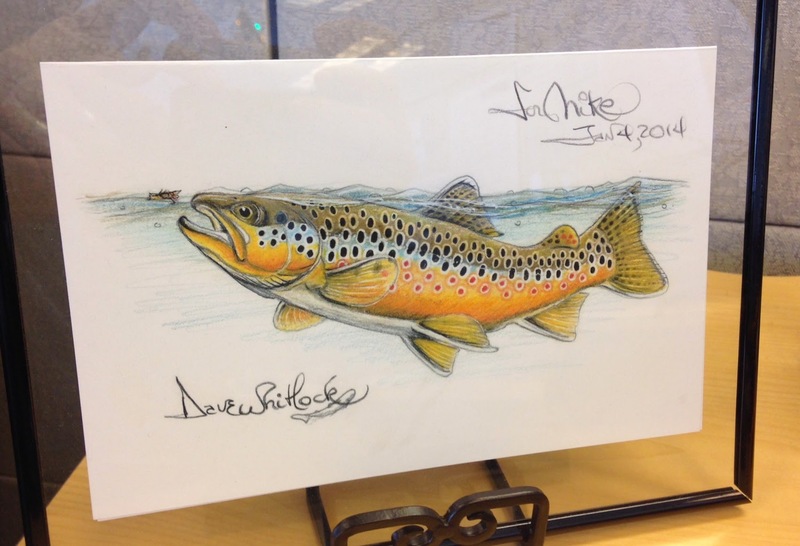 I've seen him at Fly Fishing Shows in the past, and had always wanted to purchase some artwork and talk with him. 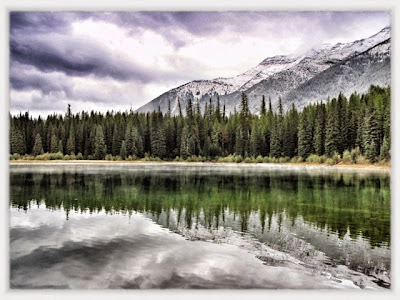 Last January, while at the Denver Fly Fishing Show, I decided to take the opportunity to pick up a couple of prints. Whitlock is one of the nicest and most genuine people I have ever met. We spoke for quite awhile and I shared my memories about the LL. Bean book he wrote. He was very gracious and humble, and gave me some interesting insight on that specific book and others he has written. I asked him if he would sign the prints I had purchased, and he said that he would be happy to do so. When I handed him the prints, instead of just signing his name, he pulled out a set of coloring pencils and took several minutes hand coloring the prints while we talked. He was very careful and thorough with his work, and did an outstanding job of bringing the prints to a new life. He then signed and personalized both prints. I've framed both prints, hanging one in my fly tying room, while the other one is displayed in my office. The experience I had with Dave and his wife Emily was great. They are both great people, and it was a pleasure meeting them at the show. Cameron took several photos of the experience, which I've shared in this post. Dave Whitlocks's art is fantastic, and I would highly recommend that you visit with him when you have the chance. Merry Christmas and Happy Holidays to you! Thanks for visiting this site during the year. It's been a fun journey, and I've enjoyed the many friendships that I have made through the fly fishing community. 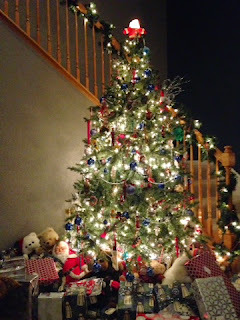 Enjoy the day with your family and friends, and I will see you on the river before long. 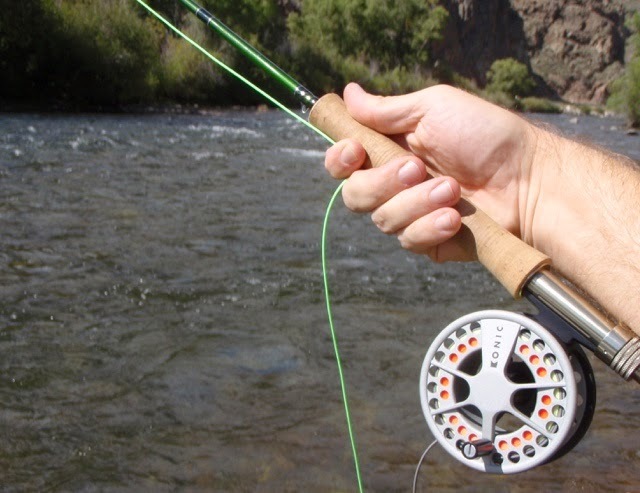 The annual Gunnison area trip was moved to September this year in an attempt to time our arrival with the famed kokanee salmon run. Several years ago we hit the run in full stride, and enjoyed catching powerful kokanee in the Gunnison River. Since that first year, we haven't really hooked into the Salmon, but always have a great time chasing the big trout in the area. Seven of us loaded into the fishing vehicles and left at the crack of dawn on the first day of the trip. Roughly five hours later, we rolled into the Gunnison area. We headed to our traditional first spot, and eagerly strung up our six weights, ready to hook into the "salmons". We had heard reports that they were in the river, and after having our licenses checked by an alert DOW officer, headed into the water to start working our favorite riffles and runs. The weather was outstanding, sunny with no wind. I started with a nymph rig and caught a nice trout shortly after I started fishing a riffle behind a rock. I fished with the nymphs for a bit, but I noticed that a nice caddis hatch was starting, and the trout were rising. Abandoning any chance at a Salmon for the time being, I hastily switched to a Parachute Adams, and caught quite a few nice trout on the surface, which was a lot of fun for a dry fly guy. Living just a few minutes from my favorite trout stream is something I don't take for granted. A few days ago, I finished a few projects that I had, and found myself with a couple of hours to spare. I threw my gear in the back of the car and drove up to a favorite spot. 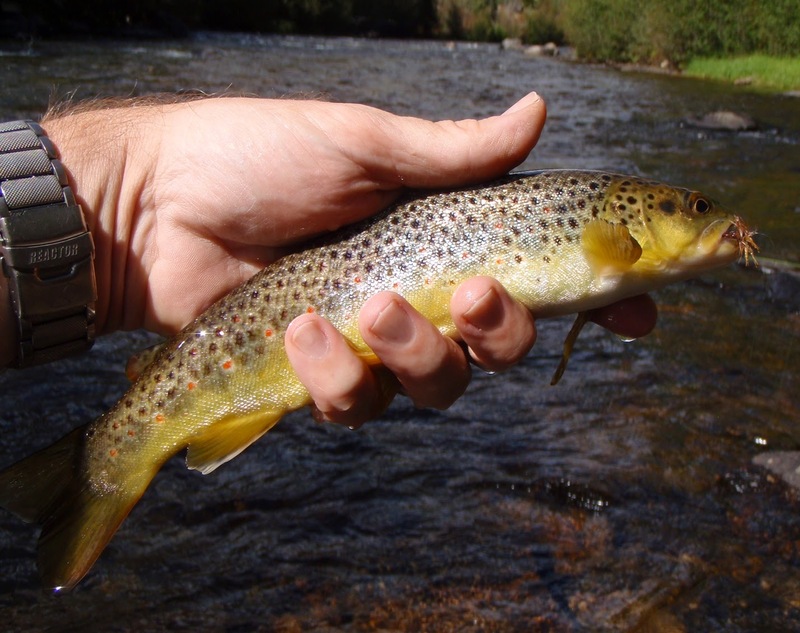 The fall air was crisp, the leaves blazing orange, and the trout were looking up! 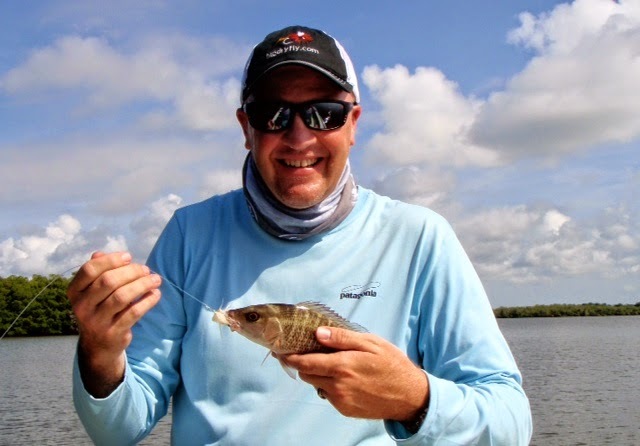 Recently I was in southern Florida, and I took the opportunity to take a guided saltwater fly fishing trip. The majority of my fishing time is spent targeting trout, but I have really enjoyed the opportunities that I've had to fly fish in the saltwater. I've always wanted to learn how to fly fish effectively in the ocean, and booking a guide is the best way to accomplish that. Early in the morning I met my guide, Captain Paul Nocifora, at a boat ramp in the 10,000 islands region, south of Naples. Paul's gleaming East Cape Vantage boat was ready to go, and we headed towards one of his favorite places. The sun was just starting to rise above the ocean, and I appreciated the beauty of the Florida coastline. 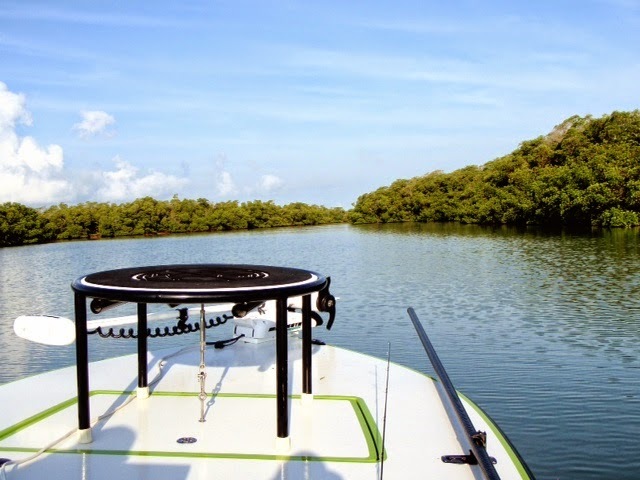 We started fishing along a channel of Mangrove trees, with Paul patiently explained the saltwater strategy to a dry fly fly fisherman. We were targeting snook, redfish, and Mangrove snapper, and I was throwing the fly at the roots of the Mangroves where the fish were lurking, waiting to attack prey that swam by. The goal was to get the fly into the root system, then strip it back to the boat. It took a bit of practice getting the heavy fly into the small windows where the fish hide, but I slowly started to get the hang of it. Paul is a very experienced saltwater guide, and he gave me some great tips. 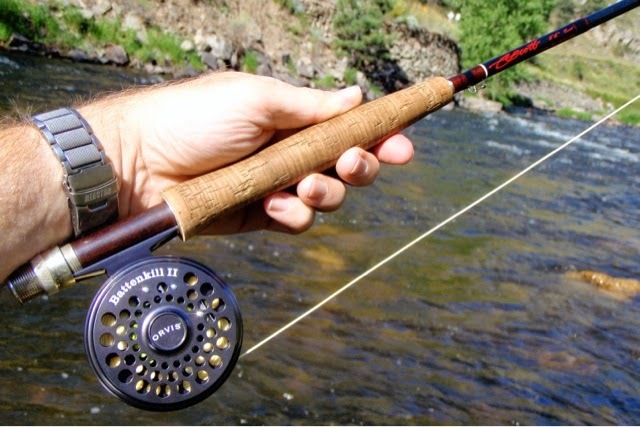 As a trout fisherman, it can be easier to get away with some casting flaws, but when you are slinging big flies quite a distance, it is important to pay attention to the mechanics. A suggestion that Paul gave me was to try and stop my back cast around 12 o'clock, and the forward cast at around 11 o'clock. Although you probably won't be able to do it, this thought process really helped me with casting fast action rods on the saltwater. Another thing that we don't do much on trout streams is the strip set. 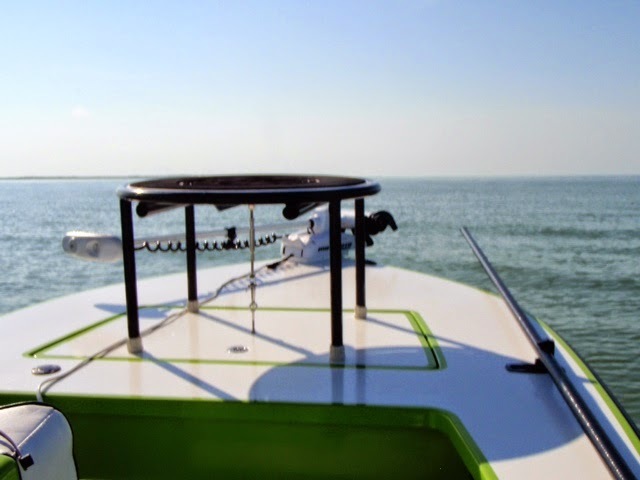 Lifting the rod tip to set the hook on a saltwater fish is a problem due to their hard mouths. Paul recommended the strip set (holding your rod tip down, or in the water while you strip the line to set the hook). During the day on the water, we covered a lot of territory, and I greatly enjoyed the beauty of the coastline. We saw a lot of wildlife, and I even cast to a few sharks (no luck!). We primarily caught mangrove snapper, and I sadly didn't take as many photos as I would have liked to since I was fishing so much! If you are planning to fish this area of Florida, I would highly recommend Capt. Paul Nocifora. 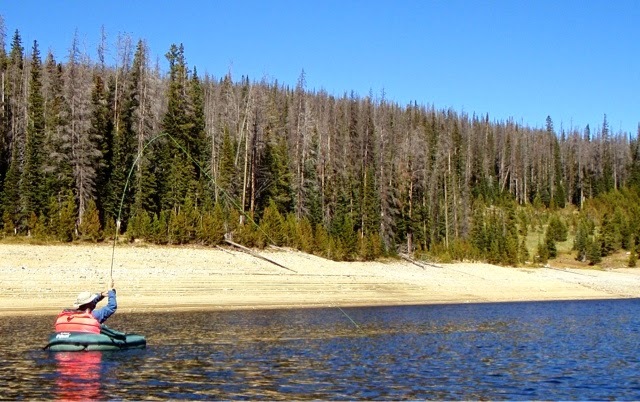 His boat was well maintained and comfortable for fishing, and his knowledge of the area was great. He was patient, fun to spend time with, and put me on fish. You can't ask for more from a guide! My good friend Marty spent the last few days fishing for steelhead in the rain. He sent me this photo of a very nice fish, which I wanted to share with the BDF readership. Marty is devoted to fly fishing, and I enjoy getting updates of his success on the river! I used to fish this river in Michigan years ago, but never dialed it in like Marty has. Nice work! My good friend Noconympher claims the water level in the river is dropping, but I'm going to wait a bit before stepping into the rushing water in the canyon. During this runoff season, I've been fly fishing a couple of lakes that have been right under my nose for years. 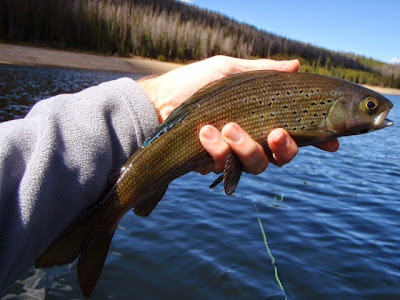 I've fished them occasionally, usually with nieces and nephews, but have never taken the time to appreciate them since they are primarily warm water species, and I'm a confessed trout snob. On Sunday, I had a couple of hours free up, so I strolled down to one of the lakes. I rarely, if ever see anyone else fishing where I generally go, but I saw a Pelican cruising in the area where I was planning to cast my clauser. We exchanged wary looks, but he continued to fish as he pleased, and I waited for him to finish. After he caught his limit and moved on, I enjoyed an hour or so of fly fishing the lake. I caught some nice fish, and will make sure that I don't neglect the fishery right under my nose. A few days ago, I wandered into the MacDonald Bookstore in downtown Estes Park. The store is a unique place that we have visited for years, and I always like to support them by buying something. While browsing the fly fishing section, a book called Fly-Fishing Advice from an Old Timer written by Ed Quigley caught my attention. I thumbed through the pages, and was immediately hooked by the content. 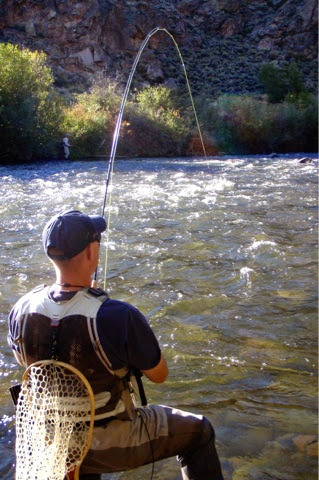 There is a ton of advice for different fishing situations that he has shared based on years of experience on the stream. I bought the book, and am looking forward to reading it. If you see the book in your local bookstore, I encourage you to take a look at it. 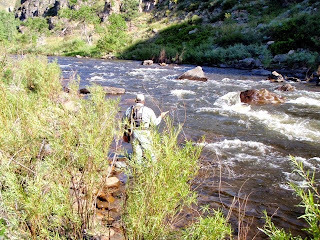 If you time it right, the fly fishing on a freestone river can be magical in the hours before the runoff explodes. A few days ago, I made a journey up the Poudre River with Dave and Jason in hopes of finding fishable water. A quick check of the stream flow report indicated that the river was at about 500 CFS at the mouth. It was too windy to float tube on a favorite lake, so we decided to travel up the canyon to try our luck. We found a nice stretch of river where the water was still somewhat clear, and mostly wadeable. Using a variety of flies (mostly zebra midges, and hares ear nymphs), we all landed nice trout. The weather was warm and the sun was shining, making the day on the water very enjoyable. 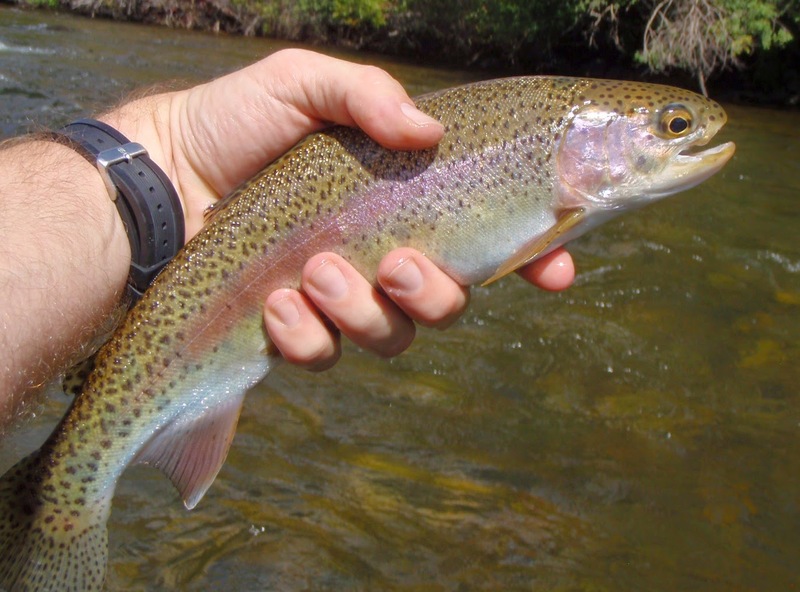 Trout can sense when the river is about to hit runoff, and they can activily feed. Although you can still do well fishing the edges of a river during runoff, I often turn my attention to the various lakes in my area during late May and early June. Enjoy your Spring fishing, and let me know how it goes! 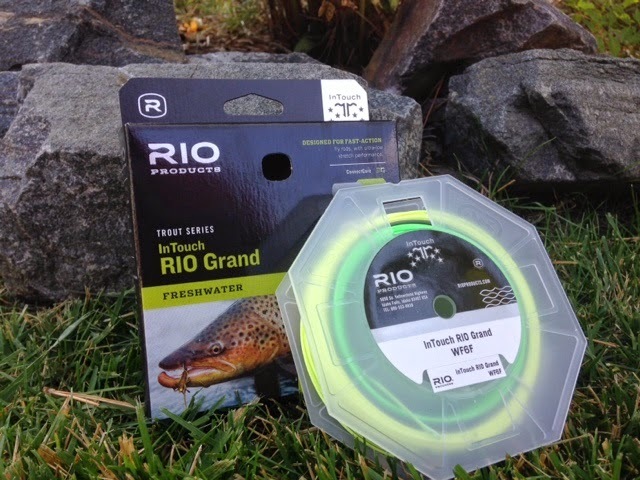 In a previous post, I mentioned that I met Scott Hunter with Vedavoo at the Denver Fly Fishing Show. Scott was a great guy, and I was impressed with the fly fishing products that he had on display. I've long needed to organize my leaders, and I decided to order a leader wallet from Vedavoo. 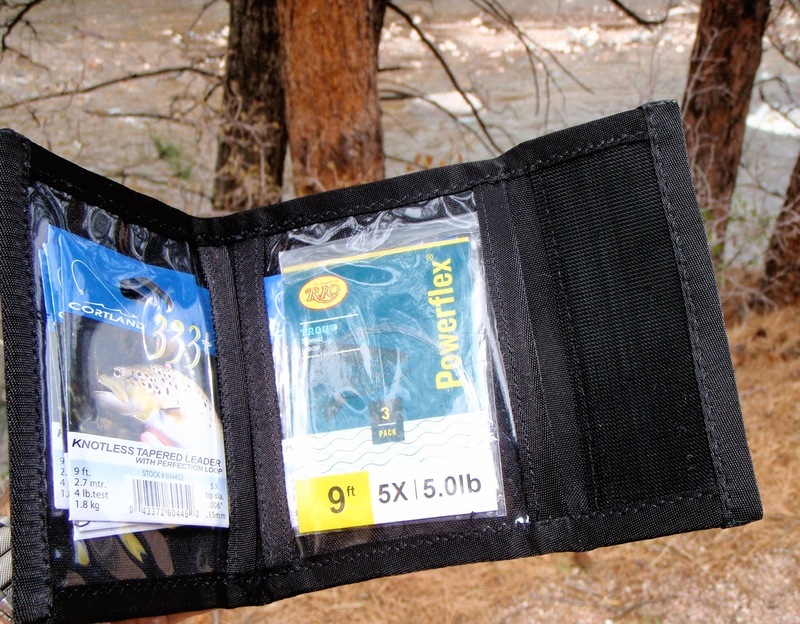 I recently received the wallet, and used it on a trip to the Poudre River last week. The leader wallet was hand built in Massachusetts using American Made materials. Even though they have several different "models" of packs and accessories each one is custom built for a customer. If you order a product, it will be built specifically for you. The leader wallet I received is very well built with tough fabric. 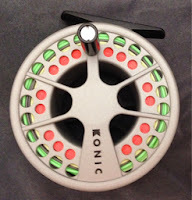 I have not counted the number of leaders I can stuff in it, but there is plenty of room to keep me fishing for a while. Although it is able to hold plenty of leaders, it is not bulky, and fits into my pack neatly. There are a lot of colors available as well, and I selected the olive. Vedavoo has very fair pricing for the high quality product you receive. This hand built leader wallet cost me about $24. 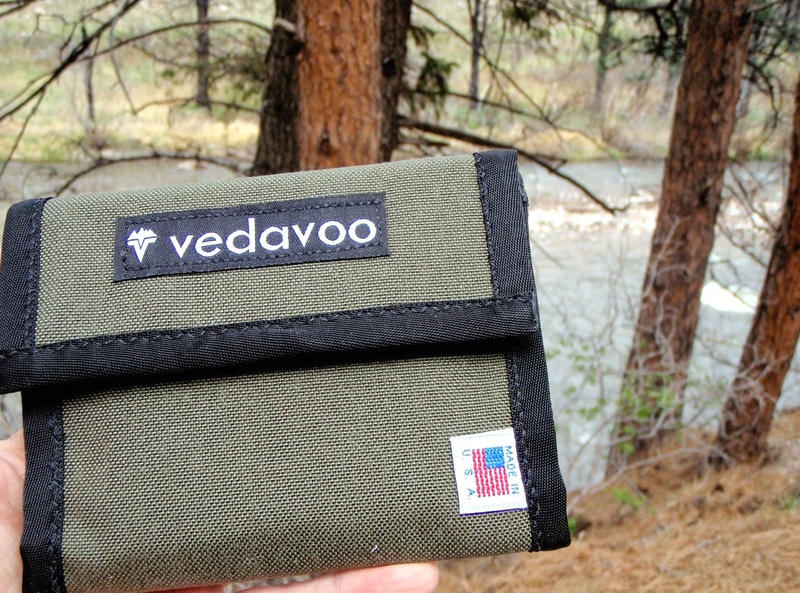 The Vedavoo leader wallet earns Dry Fly status.